Cross stitch is a great craft for people who enjoy patterns and puzzles. Creating uniform stitches and completing each block of colour on the pattern is very mindful. You can switch off as you watch the tiny crosses become a larger image and it’s a great sense of achievement to finish a big project. I learnt to cross stitch when I was little, so I thought I’d share some beginners tips. Follow along and you’ll soon be hooked on this addictive craft! Cross stitch uses stranded cotton thread, also called embroidery floss. This comes as a long string made up of six threads. Nearly all of the actual cross-stitches in a cross stitch project, will be made up of two of these threads. Find the end of the string of threads and cut a length about the size of your palm to your elbow. This is supposed to be the easiest length to work with as it doesn’t get too tangled. Separate two of these long threads and thread them through an embroidery needle. Cross stitch projects are most commonly made onto a fabric called Aida. This is made up of woven squares, and it is the holes between the squares which the cross-stitches are sewn through. The squares can also be different sizes, so it is important to check your pattern to find out what type of Aida to buy. 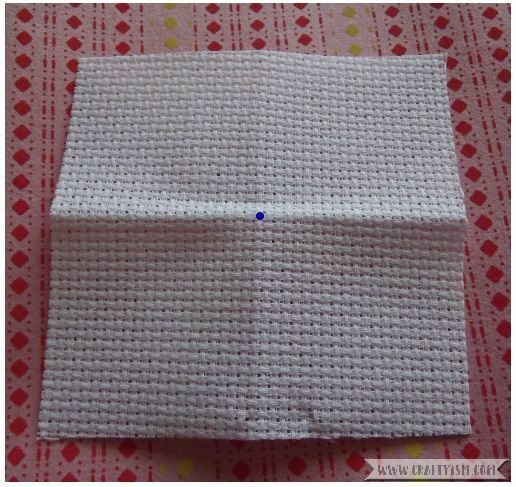 There is another fabric called Evenweave which doesn’t have holes but is used for cross stitching. I wouldn’t recommend Evenweave for a beginner as you have to be very confident in your cross-stitches. But once you’ve had a bit of practice, go for it! 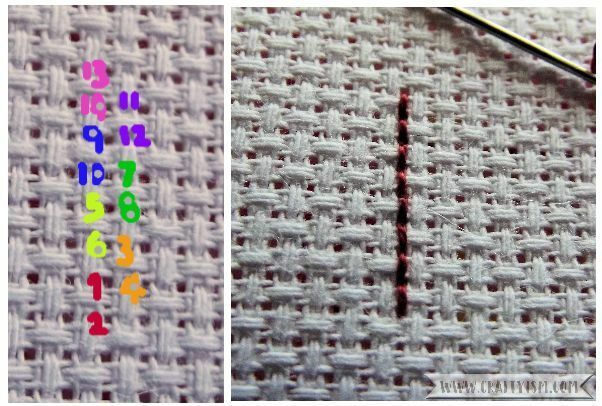 Your cross stitch pattern will have a mark, showing the centre of the design. This is where you will start cross stitching. You also need to find the middle of your Aida. This is so that you can be sure you will have enough room to fit all of your design on! Do this by folding the Aida into four. The blue dot on the photo shows where you would start stitching. If it is a large design, you should also use an embroidery hoop to hold the Aida straight. Something that makes cross stitch a bit different is that you don’t use any knots to secure the thread. To start, insert the threaded needle from underneath to the top of the Aida. Hold back a short piece of thread at the back (top photo). 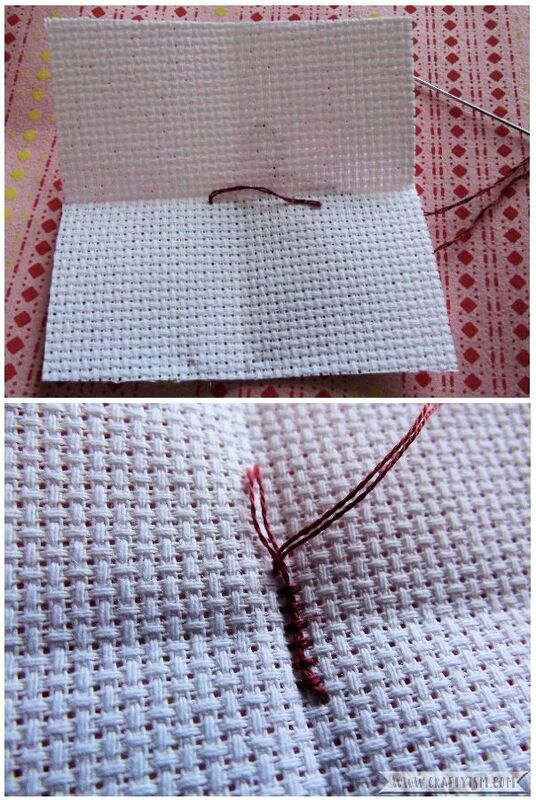 As you make your cross stitches, this bit of thread will be trapped by the stitches (bottom photo), securing it without a knot. Cross stitches are worked by making diagonal stitches from corner to corner of the squares in the Aida. You can see in the top photo how matching up the coloured dots makes the diagonal stitches. 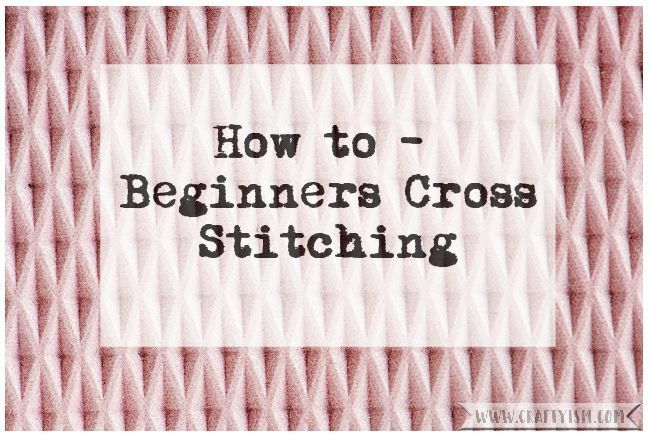 Make a row of stitches like this, rather than one cross at a time – it will look a lot neater. The next step is to go over the initial stitches in the opposite direction to create the crosses. If you follow the coloured dots in the top photo, you can see how the crosses are formed. It is important to make the cross stitches in the same directions throughout your design. If you vary the diagonal direction of your top layer of stitches, it will make a weird looking texture when you’ve finished. When you come to the end of a thread or need to change colours, it’s important not to use knots again. To fasten off the thread, make sure the needle and thread are at the back of the Aida. Slide the needle under two or three of the stitches you have made and pull the thread through. Then simply cut off the excess. The back of a cross stitch project should look nearly as neat as the front. As there are holes in the Aida, any knots or trailing threads can be seen from the front of the design. Another stitch you might find in your cross stitch pattern is a half cross stitch. 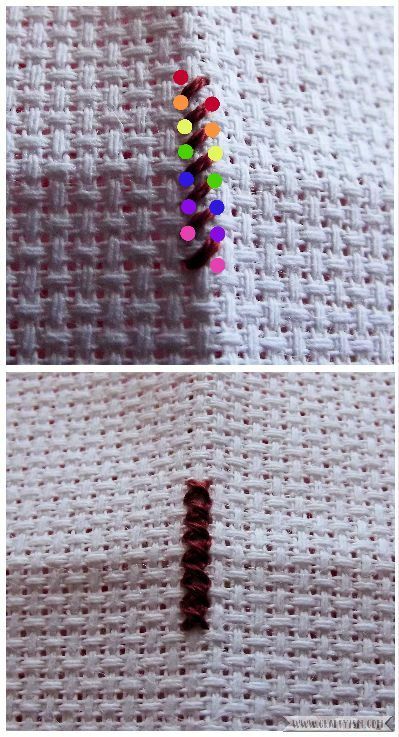 To do this, make your first diagonal stitch like normal. Then, instead of going all the way across with your second stitch, poke the needle into the Aida in the middle of the square (see photos above). This stitch is used for creating shape in your design. It’s also used for shading, when two different coloured half cross stitches are made in the same Aida square. Almost every cross stitch design will have back stitching in it. This is always done last, and only uses one strand of thread rather than two. The idea is to create a continuous line of stitching by working small straight stitches as you can see in the photo. Backstitch is usually used to outline shapes or create delicate details such as faces. I hope this introduction to cross stitching has made you curious to try it. There are lots of beginners kits which will include all your materials and instructions. The finished projects can be used as cards, hoop art or large framed wall art. Once you’ve mastered the stitches, it’s even easy to create your own patterns using squared paper. Let me know if you give it a try, I’d love to see what you stitch.